A month into the new year which means we have eleven more months to go before we close out 2019 (simple math I can handle). Have you had or taken the time to reflect on just how fleeting time is? Age changes perspective, to be sure. Young usually means time is suspended while old views it running away from us. But, that’s not what I am getting at…not really, although this age thing may play into my point. Reflection of ones’ self can be a tricky thing as we usually see our lives from a somewhat warped self-image. After all, we are looking in the mirror and may not see an accurate reflection of who and what we really are. Start with the present and with the understanding that the past certainly influences who you have become. But, don’t let that stop you from seeing who you are right now. An accurate gauge of yourself is invaluable in who and what you will become, what you will do and where you will go. I have done a great deal of reflecting over the course of the past few months and have come to some conclusions which may be of some value to you. 1. Time stands still for no one so let’s make the best of what each day offers. 2. The past with all the pain, disappointments, betrayals, fractured relationships, illnesses, deaths, etc. must be be put to bed now or they will haunt you indefinitely. 3. Forgiveness is a much greater virtue to you than the forgiven cause they usually don’t even know your pain. 4. Uncomplicate your life. Get rid of all the debris-physical stuff and emotional baggage carried with us. 5. Have faith you can and will make better decisions from today going forward because you will be better equipped to make them. 6. Have faith in a Higher Being (mine is Christ) who gives you the strength and courage to press on to a better tomorrow. 7. Enjoy today. Nothing new here and I could have added a dozen more items to consider, but this is what I have been shown so I wanted to share it with you. Have a quality and joy-filled year and life ! Stairway to Heaven (song by Led Zeppelin,1971) or Kukulkan Pyramid at Chitchen Itza, Yucatan, Mexico? Pyramid, of course, but the Mayans may have thought it was a spiritual stairway to heaven. 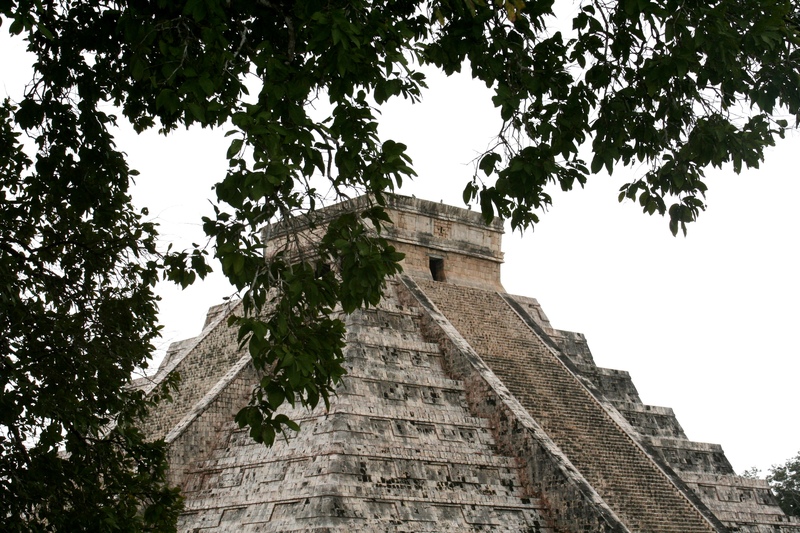 Kukulkan was designated one of the Seven Wonders of the World in 2007. This pyramid and entire temple complex is an amazing city-state of the ancient Mayan culture. There are other similar complexes throughout Mexico and Central America where ancient cultures once thrived, although Chitchen Itza is one of the larger de-forested complexes from these ancient civilizations (Mayan & Aztec). ” Do not look back and grieve over the past for it is gone; and do not be troubled about the future for it is yet to come. Live in the present and make it so beautiful it will be worth remembering. ” Author Unknown, but similar expressions of the same concept can be found from multiple sources, including the Bible.